There are so many lovely villages in the Cotswolds! Every time we explore a new village I think, “Oh, I love this one!” The village of Snowshill was like that! We made a slight turn into the village, up and around St Barnabus Church and Cemetery and then past the Cotswold stone cottages, laden with bursting roses, to admire the tended gardens and the sheep grazing in the pastures. It’s truly hard to believe there are still villages to be found like this! The cottages of Snowshill no building is level with his neighbor, the village sits on a hill. I love the Sign! Yield! What a Great Color of Blue! I Love the Color of This Barn Door! 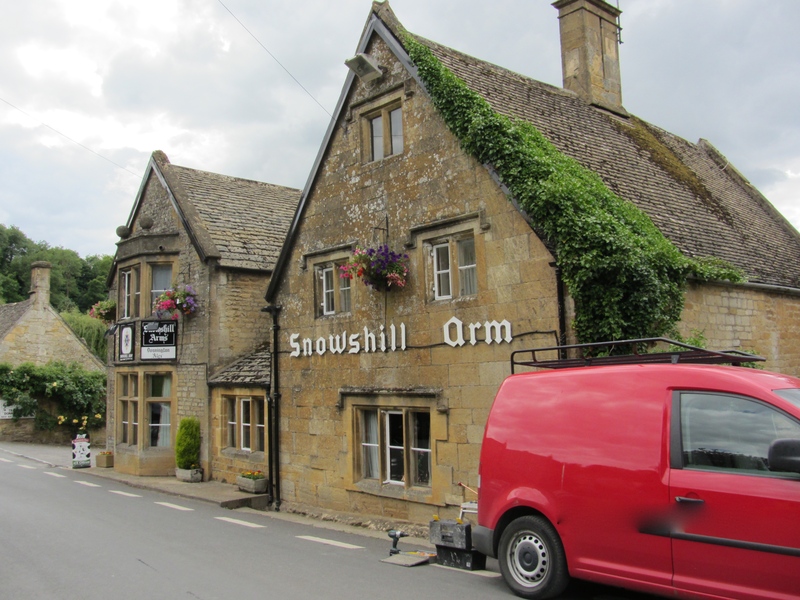 Visiting the Snowshill Arms, the local friendly pub, I see the featured Donnington beers can be found in seventeen pubs in the area! We could do a pub crawl! Better yet, for the more adventurous, there is a 62-mile circular walk, called the “Donnington Way,” from fifteen pub-to-pub sections, where you can join the walk from any pub. Some Donnington Inns offer B&B’s, so you can walk distances of your choice. There is a map available for purchase called, the OS Outdoor Leisure 45, the Cotswolds, that covers the entire route! What a grand way to see the well-kept countryside and hidden villages! Next we visit the fragrant lavenders fields of Snowshill Lavender Farm. Rows and rows of sweet fragrant lavender! There is also a retail shop and small restaurant here. A very relaxing way to spend the afternoon! Returning to Chipping Campden, let’s round out the day strolling the meadows of Broadway. Broadway Tower is a folly located on Broadway Hill, near the village of Broadway, UK. The tower was the brainchild of Capability Brown and designed by James Wyatt in 1794, in the form of a castle, and built for Lady Coventry. The tower was built on a “beacon hill” where torches were lit on special occasions. Lady Coventry wondered if a beacon built on this hill could be seen from her house 22 miles away and sponsored the construction of the folly to find out. Broadway Tower could clearly be seen! Today the tower is a tourist attraction with a country park of deer. There is also a restaurant and gift shop here. The grounds are a perfect place to picnic! Nuvofelt, The Cotswolds has to be one of the prettiest places on earth. Especially if you like flowers and gardens and picturesque villages like I do! Thanks for dropping by! Congratulations on a lovely piece I look forward to more. Best Wishes Diz White. Diz, is that short for another name? I have placed my order for your book! Thanks for telling me about it and I’m sure other readers want to know about it as well. I love the Cotswolds! I have been reading all your blog posts which are so enjoyable – gorgeous photographs and interesting information. I particularly like the Snowshill one and the one on Chipping Campden. 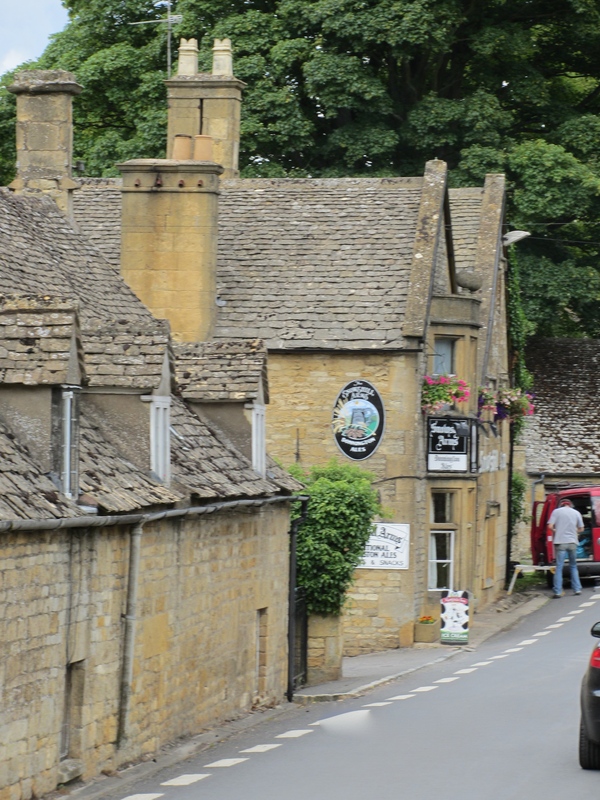 I am just writing about this area in the sequel to my book and telling of an absolutely wonderful country pub not far away from Chipping Campden near Bourton-on-the-Hill called The Horse and Groom. It’s garden has terrific views but more importantly the food is sensational. Well worth making any kind of detour to visit. 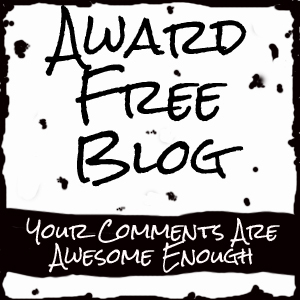 I have signed up to receive more of your excellent blog posts – which have made my day. Many thanks – Diz. Diz, you are so very kind, I am getting homesick for the Cotswolds just writing these posts! I may have to pencil off September on my calendar and just go! I have two more posts about the Cotswolds that I hope to have posted this week. One on Broadway village and another about Stanton, and Stanway House. May I suggest your book in one of these posts? I started reading it yesterday and had a hard time putting it down! I’m just past the LOO cottage that you didn’t buy! Look forward to hearing from you and I will give you more feedback as I go along. You are the first Diz, and more likely the last, I will ever know! Some of the most beautiful Cotswolds photos I’ve seen. As a Cotswolds devotee, I so appreciate photo journalism like this piece. I shall also take a look at Diz White’s book. My books are fiction and have no pictures! But setting stories in the area is proving a delight. Cheers. Stella, Thank you for the lovely post. I have been out of the country so I am just now answering comments. I checked out your books and have ordered Cold and Arabella.They look very interesting and I look forward to reading them! I just love the Cotswolds and am looking into another series of posts there! Hope to her from you again!